A first impression can either make or break your chance of landing a dream job. So choosing one of the best resume templates can give you a fantastic head start. These modern CV templates for Word, Pages, and InDesign are the perfect starting point for creating your new and improved resume! These beautifully designed resume templates will help you stand out from the crowd, help you showcase the right skills, and improve your chances of landing the job. Some of the templates are free, and others cost a few dollars. All of them are absolutely beautiful! Having a modern, professional resume doesn’t necessarily mean you will land the job, but it’s a great way to make sure you get the interview! And once you’ve chosen one, remember to read through our guide on how to customize a CV or resume template to make your own mark. Create a build your own resume template with this simple template. Add your own work experience, qualifications, and personal information and get your CV ready to go in a matter of minutes. This modern and beautiful resume template features a professional design that’s guaranteed to attract attention. It includes CV, cover letter, and portfolio templates. The template comes to you in A4 size and in Photoshop PSD, Illustrator AI, and Microsoft Word file formats. Eva is a clean and minimal resume template that also comes in PSD, AI, and Word file formats. This template also includes an additional cover letter and portfolio templates as well as a free font for customizing the design. This minimal CV template comes with both a resume template and a cover letter design to let you craft a complete professional resume. It comes in AI, EPS, and PSD file formats with organized layers and editable designs. This stylish resume template can be used to design a double-sided resume. The template is available in AI, PSD, and EPS formats and allows you to easily customize the design to your preference as well. Louis is a stylish resume template that’s most suitable for making a resume for creatives. It comes in Word, PSD, and AI file formats featuring fully layered designs for easily customizing the template to your preference. This creative resume template features a professional design that allows you to showcase your resume and portfolio in a creative way. It also comes with a cover letter design and a free font. Another clean and minimalist resume template that comes in InDesign file format. The template is fully customizable and includes fully organized layers for easily editing the resume to your preference. A creative and attractive resume template that’s perfect for designing a resume for a creative professional. This template comes in A4 size and an easily editable design. You can also change its colors and fonts using InDesign as well. This modern resume template also comes with a matching cover letter template for making a complete resume that stands out from the crowd. The template comes to you in InDesign format. This clean and simple resume template is perfect for making a CV for a designer or an artist as it comes with both a resume and a portfolio template for showcasing your work. It also includes a cover letter template as well. This modern resume template comes with a clean and stylish design that allows you to highlight your skills and experience in a more professional way. The template is available in Illustrator and EPS formats and in A4 size. A CV resume template for professionals who appreciate minimalism. This template features a simple design with minimal colors. It’s available in A4 size and comes with a cover letter template as well. This resume template is ideal for designers and creatives for showing off their skills in a more visualized CV design. The template is easily customizable with Illustrator and it’s available in both A4 and US Letter sizes. A modern resume template that comes with a clean design. This template will allow you to feature skills and experience along with references all in one place. It also comes with a cover letter template as well. This clean and minimal resume template features a modern layout where you get to showcase your skills and information with both visuals and text. The template is available in A4 size and in both Photoshop and Illustrator formats. Another creative and stylish resume template especially suitable for writers, marketers, and designers for making a CV that stands out from the crowd. This template is available in both Photoshop and MS Word formats. This resume template comes with a modern design that allows you to highlight and show off your personality through the design. The template can be easily customized with Photoshop to change colors and fonts. A unique resume template designed for professionals in corporate industries. This template features a 3-page resume design and it also comes with a matching cover letter and business card templates as well. This is a 3-in-1 resume bundle that includes templates for creating a resume, a job application, and a portfolio. All templates feature the same style of design so that you have a chance of standing out from others. This colorful and highly visual resume template is most suitable for designers, artists, and illustrators. It comes in A4 size and in Illustrator and EPS file formats with organized layers. This resume template is available in both A4 and US Letter sizes. It includes a 2-page resume template and a cover letter template. You can also easily edit and customize it as well. This professional resume comes with a modern design that quickly attracts anyone’s attention. It also comes in A4 size and in 3 pages for the resume, cover letter, and the portfolio. This special templates pack comes with 7 different resume and CV designs. Each template is also available in 7 different color versions. The templates are available in Photoshop and Illustrator formats, and it’s a simple way to get a collection of some of the best resume templates all in a single place. If you’re a creative or someone who works with art, this template will be perfect for your resume. This is a unique and a creative resume template that features a colorful design for standing out from the crowd. A resume that features a mix of both a modern and a minimalist design. This template comes as a PSD file for easier editing with Photoshop. It’s ideal for web designers and developers. A simple yet a creative resume template that will suit almost any type of a job application. The template is available in print-ready PSD format. You can easily customize it to fill the template with your information. This is a resume template with a professional design. It comes in both Word and InDesign formats. The template has 2 pages and a cover letter. You can use it in both A4 size and US Letter size as well. A simple resume template that comes with a design that allows you to showcase your information in content blocks. This template is available as both a Word and InDesign formats. 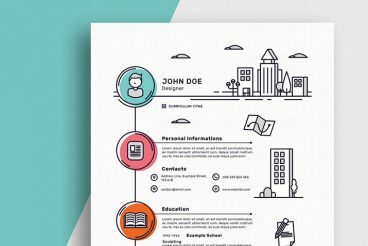 This is an infographic style resume template that’s more suitable for designers. This resume will let you showcase your info in a more visual style than others. It also comes with a matching cover letter as well. This resume template clean and minimal and it gets the job done perfectly. It’s a single page resume template that’s available in Word and InDesign. You can also customize its colors easily. A stylish resume template that uses an eye-catching visual design for beautifully featuring the information in an A4 size page. The template is also available in 5 different color variations as well. Another simple resume template that’s perfect for creating a basic resume. This template is available in 4 different color variations and it comes in 4 print-ready PSD files. Why settle for one template when you can get 10 for the price of one? This bundle comes with 10 professionally designed resume templates and 4 business card designs. All worth $182. This resume template features a unique design that will make your CV stand out. It comes in both A4 and US Letter sizes and it’s compatible with Microsoft Word. A two-page Docx resume template with a classical design. Also, includes a set of icons and customizable Adobe InDesign files. This template comes in InDesign, PSD, and Word files, allowing you to customize it using whichever app you prefer. The resume is 3 pages long. Featuring a clean and a modern design, this CV template also comes with a cover letter template. It’s available in Illustrator, InDesign, PSD, and Docx formats. A CV template with a unique and a modern design that seems ideal for web designers and developers. It’s available in 3 versions of 2 page resumes, including light and dark themes. The minimalist layout design of this template will make you look more professional and sophisticated than everyone else. The resume features 2 pages and a cover letter. Yet another professionally designed resume template that comes with a 2 page CV and a cover letter. Available in A4 and US Letter sizes. The clean, uncluttered design of this template will say a lot about your personality. This template will definitely help land you a job interview. This template is for the serious professionals with lots of experience. It features a 7-page resume template, which supports InDesign, Photoshop, and Illustrator. A basic resume template that’s suitable for all types of professionals. It features a resume, cover letter, and a set of icons. Supports MS Word, InDesign, and Photoshop. Another classical template that includes a massive 21-pages of resume set specially designed for creative professionals. It includes 60 icons and available in PSD, DOC and DOCX formats. A minimalist, US letter sized resume template that comes in 3 color versions. It can be customized with MS Word. This MS Word template features a resume with an attractive design and a nicely formatted layout. Stand out with a unique resume that looks like no other. This template uses an infographic style design for the resume. And it supports Photoshop, Indesign, and MS Word. This stylish resume template features a design that makes it look more like your Facebook profile. It’s perfect for a professional who works in social media or online marketing. Can’t decide which template is right for you? Then grab this bundle and choose from 15 different templates. Use a different resume for each job application. ‘Elliot’ is a clean multipurpose design, which includes a single page resume/CV and cover letter. All artwork and text is fully customisable; Easily edit the typography, wording, colors and layout. Each template uses a strong baseline/document grid which will allow you to edit or add to the layout very easily. Get refined and get noticed with this three-page template design, including handcrafted two-page resume and cover letter – because your life shouldn’t have to fit onto one page! From the first hello in your covering letter to your glowing references, let potential employers know that you’re the full package. The bundle contains beautifully designed CV template. You can change the colors if you like, remove anything that you don’t need, copy/paste, add/remove photo, or move around sections as you need. You can also remove the bars under “Skills Section”, and just use text. This resume is minimal and uses a very clean and neat layout to focus on your data and easy customization. Elegant and minimal resume/CV template for designers, developers and professionals in any industry. Simple and professional layout for maximizing your impression. This template is inspired in an elegant color palette. You can change the colors if you like. Pack includes 2 pages resume template in Microsoft Word (.doc, .docx), cover letter template in Microsoft Word (.doc, .docx), fonts, color change feature in 1-click and unlimited assistance. Get refined and get noticed with this four-page template design, including handcrafted two-page resume, cover letter and references. You can get your hands on these templates for just $15. The pack contains high quality, modern and elegant CV templates that are drawn by professional designers. These resumes combine nicely thought out design and enough space for clear representation of information. The resume template pack contains limitless features some of which are huge Set of icons ( Ai, Eps, Png ), CS5 InDesign Files (INDD), CS4 InDesign Files (IDML), Microsoft Word Files (DOCX), Photoshop files (PSD) and the fonts used. Minimal and very easy to use CV template. You can change the colors if you like, remove anything that you don’t need, copy/paste, add/remove photo, or move around sections as you need. You can also remove the bars under “Skills Section”, and just use text. Resume Template with Cover Letter and photo for Word format. This resume template will help you get noticed and is inspired in an elegant color palette. You can change the colors if you like as it’s completely editable. Introducing ‘Frankie’, a simple professional design with emphasis on your profile, education and experience. Including a single page resume/cv and cover letter. The Elegant Resume/CV Set Template is designed to make your printing experience even better with neatly designed layout, CMYK color and layer organization. The pack includes 300dpi CMYK templates in Illustrator AI, Photoshop PSD and Microsoft Word DOCX file formats organized into well-labelled layers for easy customization and updates. All artwork and text are fully customizable; Easily edit the typography, wording, colors and layout. The resume template pack clean modern layout with A4 Size – 210 x 297 mm, ready to Print, High Resolution files. You can easily change the colors and modify the text. The 10 massive resume CV mega bundle contains two pages classic resume CV template, all in one single page resume pack and hipster versions. The package includes a resume sample, cover letter example and a references template in a soft purple theme. This resume is compatible in Microsoft Word only. A super clean, but attractive design that is easy on the eyes. The template is fully editable and comes in both WORD and PSD format. This is a specially designed handcrafted resume with cover letter template in clean hipster style. You will be able to create your own fully customizable resume set where you can display your education, skills, references and experience. There is a lot of different ways to customize your resume and it all comes for mere $14. Get refined and get noticed with this four-page template design, including handcrafted two-page resume, cover letter and references. From the first hello in your covering letter to your glowing references, let potential employers know that you’re the full package. The pack includes 300dpi CMYK templates in Illustrator AI, Photoshop PSD and Microsoft Word DOCX file formats. Files are organized into well-labelled layers for easy customization and updates. All artwork and text are fully customizable. Introducing ‘Brice’, a simple, vertical design which includes a single page resume/cv and cover letter. All artwork and text is fully customisable; Easily edit the typography, wording, colors and layout. Each template uses a strong baseline/document grid which will allow you to edit or add to the layout very easily. You’ve got the skills. You deserve a resume that reflects your expertise and makes your first impression count! The Emily is a fully editable Microsoft Word (.docx & .doc) resume and cover letter template. Get refined and get noticed with this four-page template design, including handcrafted two-page resume, cover letter and references – because your life shouldn’t have to fit onto one page! From the first hello in your covering letter to your glowing references, let potential employers know that you’re the full package. Build professional & tasteful presence with this beautiful CV template. This design will help you succeed in which ever job you’re looking for. This elegant and professional resume will help you get noticed. The package includes a resume sample, cover letter and references example in a pretty chic theme. This template is easy to change colors, layout and fonts to suit your needs. With this classic resume template, you can show off your skills to potential employers in a clean, professional manner, and since it uses soft blues and grays, this soft splash of color will help your resume stand out from the crowd. This resume template is built in Microsoft Word so you can edit it quickly and easily. This resume template includes one-page and two-page resume templates as well as templates for a cover letter and a reference page. This is a specially designed handcraft resume CV with cover letter template in clean hipster style. You will test a vintage style and fully designed in black and white color also ironic. You will be able to create your own fully customizable resume set where you can display your education, skills, references and experience also a real and very effective cover letter. And there is A LOT of different ways to customize your resume. Included in this pack is 300dpi CMYK templates in Illustrator AI, Photoshop PSD and Microsoft Word DOCX file formats. organized into well-labelled layers for easy customization and updates. All artwork and text are fully customizable. You can easily edit the typography, wording, colors and layout. rofessionally designed, easy-to-edit template package for the job seeker who wants to leave an unforgettable impression. Fast track your job search with a resume as professional, creative, and versatile as you are! Fully customizable in Adobe InDesign and in Microsoft Word. Christian Silk is a super clean and minimalistic gentleman. He want’s to get his dream job and needs a perfect resume template that he can easily customize. He’s not a tech geek, you know. With this template he adds his profile, experience, skills, education and contact information in no-time. He is now able to make a great first impact with professional styling and personalized look. Christian is now confident to apply to his dream position. A minimally designed freebie resume template that is absolutely perfect for helping you in landing your next job. The template is available in PSD format. A thoughtfully designed CV or resume can help you stand out from other candidates, and make a memorable first impression. It isn't enough to use the standard template in MS Word—you need to be thinking more creatively! In this series, we're sharing tips, advice and templates for creating the perfect CV or resume!